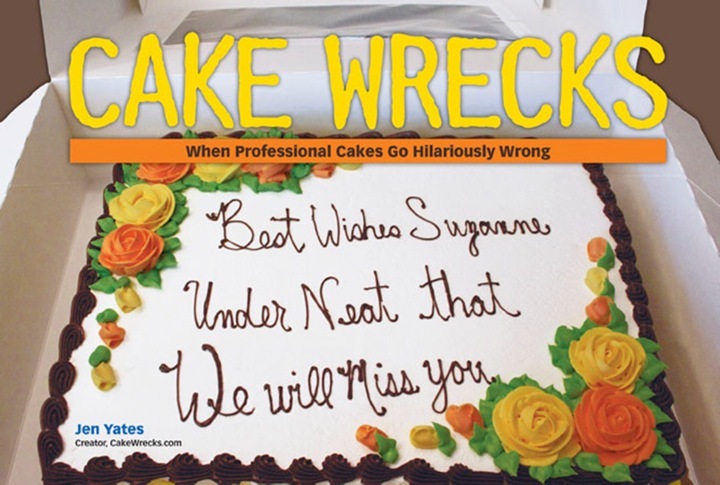 Cake Wrecks - Home - Twins! [setting glass down] Ahem. Wow, who knew sarcastic sounds of [cough, cough] contempt could be so dangerous? Whew! Gonna have to dial back the maniacal laughter in the future. What's that? The Wreck? Oh, well, Mandy, I gotta tell ya: Transporter malfunctions like these are why I prefer to travel by shuttlecraft. Bahaha!! My favorite part is that one paw has 6 claws, and the other has 3!!! That's awesomeness. i especially love how the 'cat' has 6 claws on one paw. nice. I am insulted! The is the logo for the University of Kentucky! That CCC, though, is about as bad as their basketball team this season! Oh goodness... "The mutated alien is gonna eat me" is not something someone should say when presented with a cake. The evil CCC rears its ugly head yet again. How does that 'cake' even come close to the logo? Do people really step back from work like that and go 'Yeah! I think I nailed it!!'? It's not bad enough that the cat looks dismembered, but they couldn't even make a decent letter U-come on-why would you ever enev sell that? It's a dreaded CCC, too! Hilarious. That would be about the extent of any of my cake creations...sadly. Demon bobcat karate chop action! Keeeyahhhhh! It's the University of Kentucky Wildcats logo. I *love* the 6 claws on the one hand!! I have to say - I look forward to reading this blog every day. Thank you for all the giggles! Hahaahaaa!!! !Laughed for a whole minute at the reference to Dr. McCoy's hatred of all things transporter! And at the thought that the ccc is the outcome of a transporter malfunction! Hahaaahaaa!!! Well, THIS should shut up the complainers who don't like your definition of "wreck". This one is a wreck by ANY definition! Wow, It's like seeing double. I bet you could just overlay those pictures and they'd fit perfectly. It's uncanny how much they look alike. I'm,.... I'm,... I'm.... SPEECHLESS! Poor little guy - he's more scared of us than we are of him. It almost looks as though the cupcakes slid over a little too far, causing the disproportionate look....but wouldn't that cause the icing to split? well, they got the "recked" part right. I love trying to figure out which pieces of that are actually supposed to be limbs. If you told me it had 2 heads, I wouldn't question you. Ack! My family and I are all HUGE UK fans, and we're insulted, lol! Please tell me this wasn't made by a fellow Wildcat! definitely gotta be tough when they bring a picture for you to replicate! A large part of the problem seems to be that the cake was made to conform to the dimensions of the precut cardboard liner and plastic box. I don't think this travesty can be laid solely at the feet of the poor embattled CCC. I live in Lexington, which is where the University of Kentucky is located. This wreck just made my day because I am incredibly tired of hearing about UK's basketball team! Thank you!!! This looks *exactly* like what would happen in that "blind pictionary" game (you have to do it in Cranium). I'm not sure how you'd do that with cupcakes & icing. Maybe there's an in-between sketch missing. The customer's blood vessels went "SPING!" when they saw this monstrosity. I will walk up to the six-fingered wild cat and say: "Hello... My name is Inigo Montoya. You killed my father. Prepare to die!" University of Kentucky basketball Logo. that is horrible! I am definitely offended at that CCC! I live in Lexington & am a UK fan & UK does not deserve something so ugly! see i like cupcakes...and i like cake. but just put a bunch of cupcakes on a plate each individually decorated. that looks like a 6-toed demon cat getting attacked by gumby's long lost headless blue twin brothers. UK fans, i feel sorry for you. From the Picasso Bakery on 4th. I love this blog but sometimes my geekiness fails and my dear husband (king computer geek) has to explain references. That's one of the funniest CCCs I've ever seen. I'm grateful you showed us what it was SUPPOSED to look like for 2 reasons: 1-I really wouldn't have known what it was supposed to be without it, and 2-The comparison is hil.ar.i.ous! While this CCC is just horrifying, I have to say, whose bright idea was it to request this logo as a CCC versus a sheet cake? It's like they're asking for a wreck. They're lucke it didn't look worse. Ha! @ Michelle, love the Princess Bride comment! Seriously though, if you hadn't included the picture, I would have no idea what that was supposed to be. March 30, 2009 | Katie H.
I love the way all the components are there without coming together to mean anything. I imagine the cake whispering, "Kill me. Kiiill meeee." OMG I am a University of Kentucky alum and I am totally appalled at what I am witnessing. Almost as appalled at how bad the basketball team did this year. But not quite. It still amazes me when I see the pictures of wrecks that are clearly at somebody's home. Why on Earth would you BUY them? If I special ordered a cake and it looked like that, I would not pay for it. As a Kentucky native and a huge Wildcats fan, my heart just breaks! In what weird warped view did that person think the ccc beared any resemblance to the Cats' logo?! *weakly* Go cats. (Looking at logo) UofK has a really cool logo. (Looking at CCC) .... (Back to logo) UofK has a really cool logo. The CCC looks like the cat is trying to karate chop with its freakishly huge back foot. And what's the letters L, K, and a teeny J supposed to stand for? Heh. Is it just me, or is he choking on a vienna sausage? Well, as a Duke fan, and therefore anti-Kentucky (see Duke vs UK 1992 NCAA tournament) I think it looks great - just like the UK basketball team... er..., I mean the UK logo.